5 days from £1745pp plus international flights. This five-day trek is an unmissable opportunity to spend time amongst the might Andean peaks, traversing grassland, arid plains, walking through forests and valleys, past cascading waterfalls and happening on ancient Inca sites. It's a rich mix, but it's not too arduous a route (though bear in mind that it is at altitude) and needs no previous climbing experience. 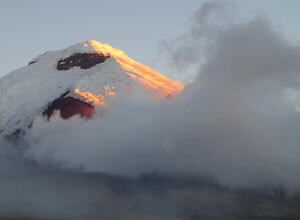 During the trek you'll reach two lofty summits for fabulous views of the surrounding mountains, including the imposing, snow-covered Cotopaxi. Your guide, an expert naturalist and experienced climber, leads you along the varied tracks and trails, pointing out sights of interest and giving you time to enjoy the views and take those all-important photographs. You won't miss out on creature comforts. You'll be staying in lovely mountain lodges and homely haciendas, where friendly service, cosy accommodation and delicious food combine, making you feel right at home. We think this is a lovely addition to any holiday to Ecuador, giving you access fabulous Andean scenery as you enjoy the benefits of healthy exercise and plenty of mountain-fresh air and rewarding you with a great sense of satisfaction on the successful conclusion of the hike. This itinerary starts and ends in Quito. 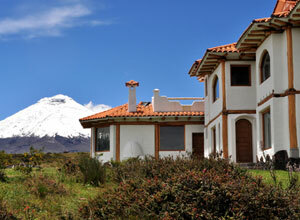 You'll need accommodation in Quito before and after the holiday, which we are happy to book for you. International return flights from the UK will cost from around £900 per person, depending on availability and season. 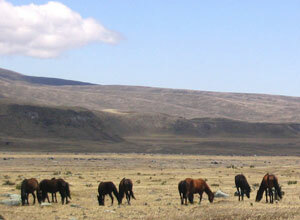 Departure dates: This is a tailor-made holiday and can begin on the day you choose. 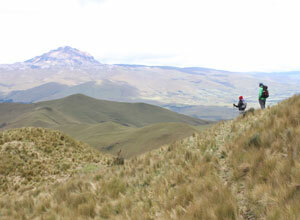 This is the first ever good quality lodge to lodge trek in Ecuador. For you the joy of the trip is the ability to trek through some stunning landscapes, up to high passes, through cloudforest, across rivers and paramo (high altitude grasslands) and even up to glaciers. 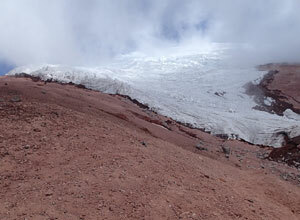 On another level this trip serves to highlight the need to protect natural resources, especially water sources, as the glacial meltwaters of Cotopaxi National Park feed the water needs of Quito. Also, the lodges employ local people, and some experiences of rural local life (eg milking cows or making cheese) are on offer as well as horse riding.